Idaho is a state you do not want to miss on your United States road trip or vacation. The ecological treasures are like no other place in this world (at least, according to the people of Idaho). This state is filled with so many beautiful, diverse landscapes. At times, you might feel you are in Iceland instead of Idaho. Mesa Falls are 110 feet tall at their highest point, with the lower section coming in at 85-feet tall. Mesa Falls is the only waterfall in Idaho that is not being used for irrigation. Mesa Falls is an easy walk, suitable for all fitness levels. This is a great place to spend the day and take in the different views while enjoying a picnic and being surrounded by nature. Fern Falls are one of the easier waterfalls to access in Idaho; you can reach them with a 200-yard hike. The trails are easily accessible and are great for all ages and fitness levels. Fern Falls are pretty to look at year-round but are best enjoyed in the springtime due to the higher volume of water. This is the perfect afternoon spot for a family picnic. Fern Falls are rather unique and picturesque due to the fascinating way the water sprinkles and runs down the cascade. The beauty of Fern Falls will presently surprise you and your family and you won’t want to miss out on a trip to this place. 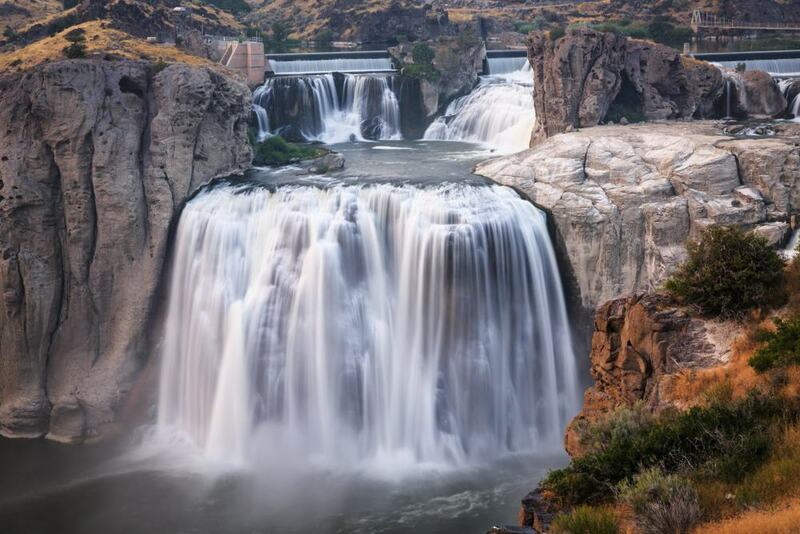 Depending on the flow of water — controlled by Idaho Power — the falls can range in pressure. Regardless of the conditions, Shoshone Falls are still amazing to visit at any time. These falls are great to watch at sunset, as the fading light falls perfectly over the cascades. If you come in the afternoon, you might get lucky with a rainbow. If you are in the southwest part of Idaho, this is a must-see attraction. Kayaking, paddle boarding, or canoeing are the best ways to accesses Pillar Falls. 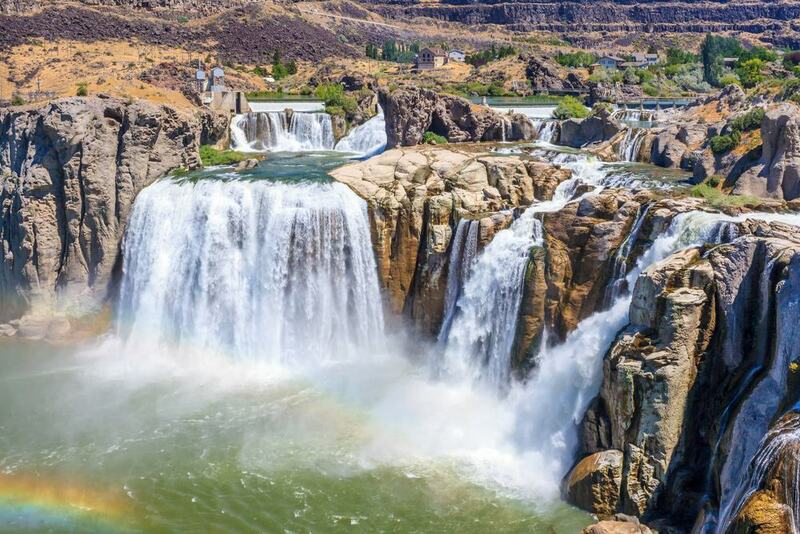 Named from the several pillars that divide the channels of Snake River, Pillar Falls is found near Twin Falls, Idaho. The water drops around 20-feet and Pillar Falls is best viewed from the water; this is a unique way to see a waterfall; definitely something different from your traditional hiking and cycling opportunity. Devil’s Punchbowl is a rather unique name but is very apt. This waterfall is a little different, as the water flows through a small gorge. 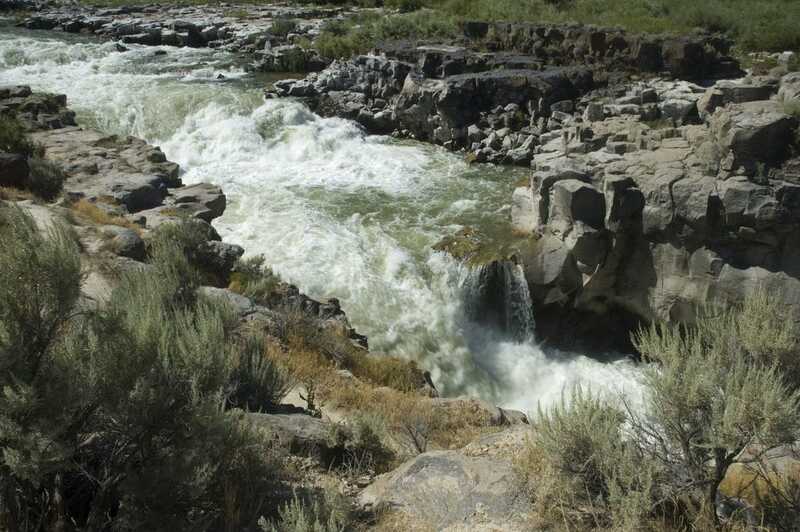 Depending on the season, the water flow will vary but is usually the strongest in the spring. This hike is easy and great for the whole family. In order to access Devil’s Punchbowl, follow the Interstate 84 until you reach Malad Gorge State Park. The falls are so close to the road you will see the vehicles pass by from the bridge behind the falls. Cauldron Linn is another waterfall in Idaho that looks like it should be somewhere in Iceland or Greenland. When visiting Cauldron Linn, you will be welcomed with not just one waterfall, but two cascades and both are within close walking distance of each other. The views are a little different with Cauldron Linn waterfall; you will see the views from the top of the falls going down. This vista creates beautiful photos of the cascade from the top, showcasing the amazing scenery surrounding the falls. Elk Creek Falls is comprised of three different water drops; the upper falls, the lower falls, and, of course, the middle falls. This hike is for the more adventurous; it’s a little trickier than some of our other listings. You can find the trail outside of Elk River. 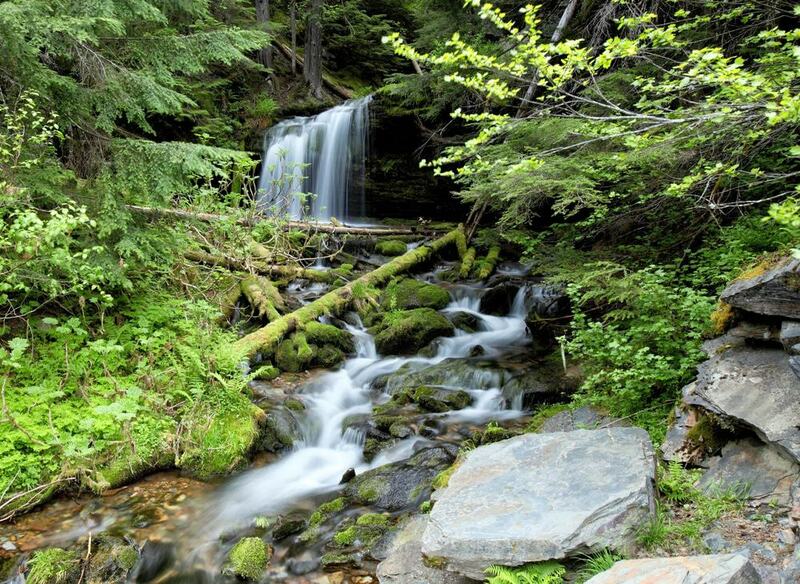 Many people want to hike Elk Creek Falls because of the scenery and the crystal-clear water. Upon hiking to Elk Creek Falls, you will pass many photographers because this place is really something to capture. Don’t forget to bring plenty of water and your camera. Perrine-Coulee Falls is a place you would find on a postcard. It is located just off Canyon Springs Road. You can park at nearby Canyon Crest Dining and Event Center. A unique feature of Perrine-Coulee Falls is that you can walk behind the waterfall; it makes for some pretty incredible pictures. Make sure you are ready to get a little wet, depending on the wind. There are some facilities located close by. Earl M Hardy Bon Canyon Springs Nature Preserve is a beautiful place located in Thousands Springs State Park. 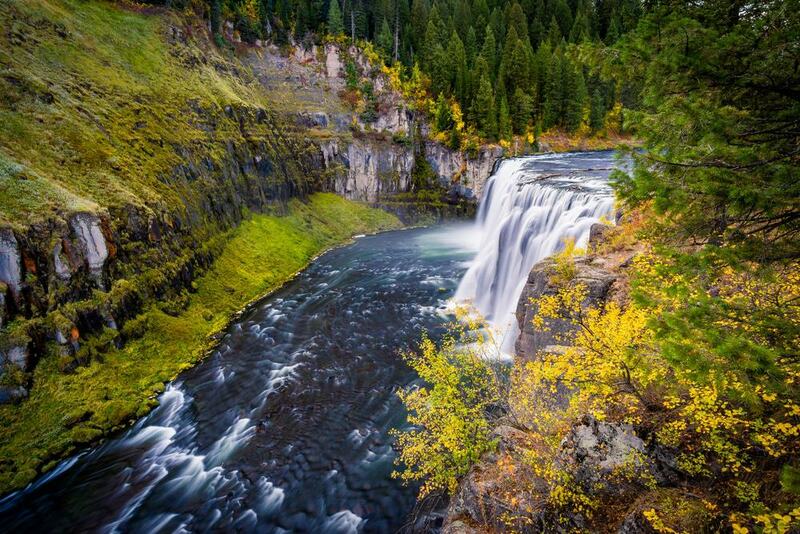 This place is one of the most striking areas in all of Idaho but involves a one-mile walk to view the falls. Don’t arrive too early in the morning if you want to see the sun shining over the falls, creating a turquoise color to the pool at the base. This is a great site for pictures and laying down a blanket for lunch. You can walk right around the falls and get different photos from a variety of viewpoints. There are a few different signs with information describing the falls and the history behind them. Niagara Springs is located inside the Snake River Canyon, which is found in the Thousand Springs State Park. These falls are rather small, but the water is constantly flowing. Needless to say, this is one of the most photographed places in Idaho and is easy to access. On the other side of Niagara Springs, you can find Snake River, which is also an incredible sight — it’s a two-in-one park to visit. 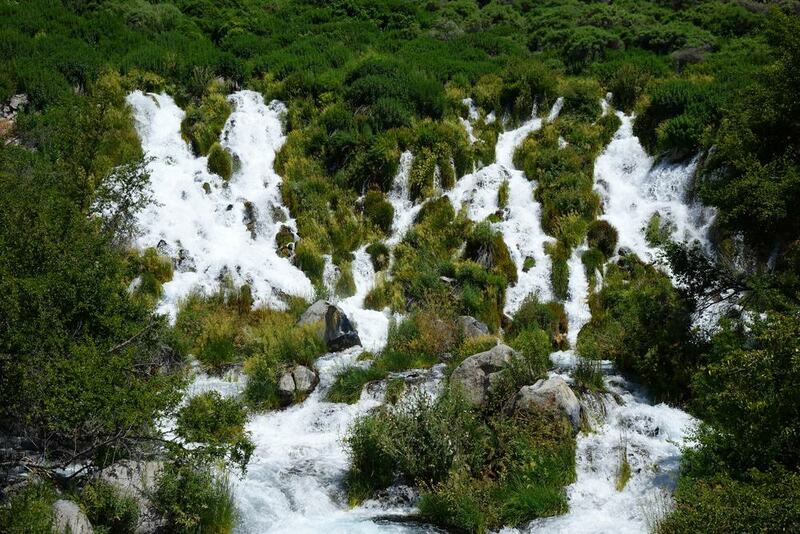 You won’t want to miss Niagara Springs while spending some time in Idaho. Auger Falls is a location best known for their cycling trails. 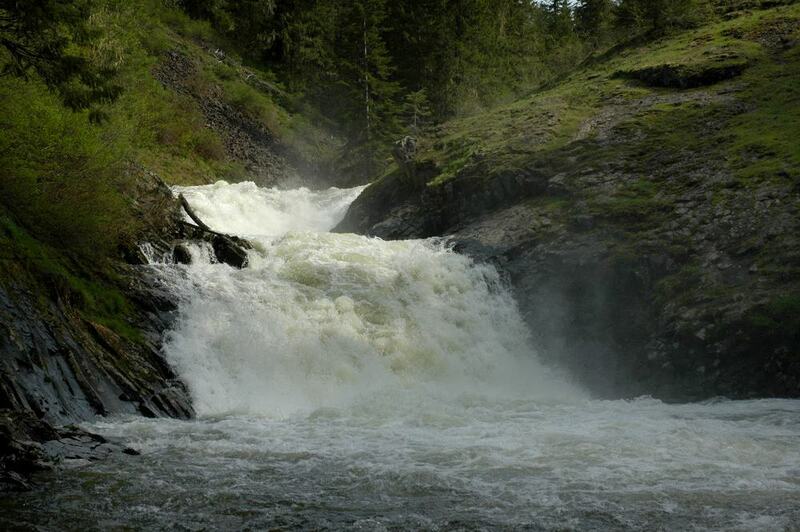 Many people learn how to mountain bike in this area and are rewarded with incredible views of Auger Falls. These trails are great for all levels of hikers and bikers, as you have many different trails to choose from — no trail is too steep. Auger Falls offers wide-open views of the scenery and terrain from a distance. If you are looking for a place that is not overly crowded, this is the place to come. It offers a tranquil experience, with plenty of things to see and trails to experience. Ritter Island Falls is hands down one of the best places to watch the sun go down. The pictorial location will send you off with incredible pictures of the falls and the surrounding landscapes. Ritter Island Falls can be accessed from the road descending to Ritter Island, which is referred to as Thousand Springs Grade. A fun thing to do if planning on visiting Ritter Island is to head to 1000 Springs Resort and watch the waterfall under the stars while enjoying a beautiful campfire. This resort is located across the river from Ritter Island; it is a fun attraction for the whole family to enjoy. Twin Falls is located on the Snake River. 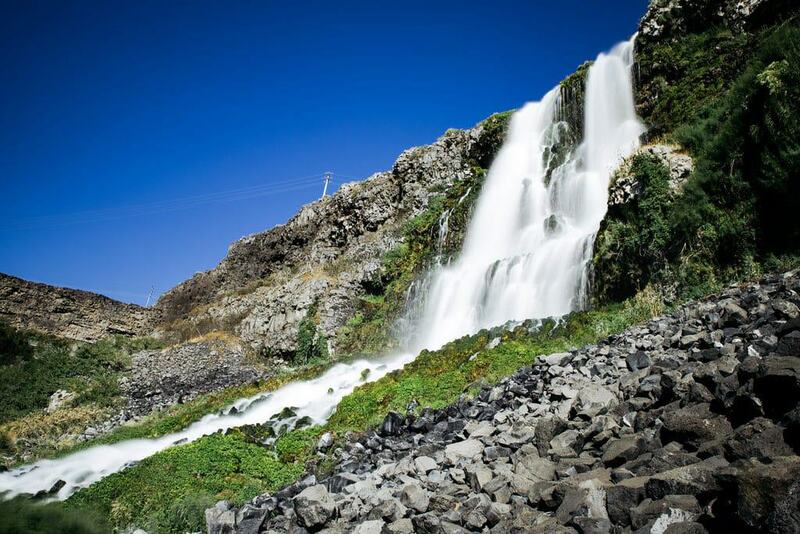 The name Twin Falls derives from when the waterfall had two separate drops at the split of Snake River. Twin Falls is a beautiful waterfall to explore and is best seen from the water. It is very rocky along both sides of the falls and your views will come from the top of the cascade. This place is great for all ages and levels of hikers; there is a smooth path that leads to the falls. Hellroaring Creek Trail leads to small series of waterfalls located along the way to Hell Roaring Lake. This trail is rated as moderate in terms of difficulty, due to the 10.7 miles you need to trek. Hellroaring Creek Falls and Roaring Lake is located near Stanley, Idaho. It is a beautiful place with lots of wildflowers and many different species of birds. Dogs are permitted on leashes. The best times to visit Hellroaring Creek Trail is between May and September; however, it is open year-round. 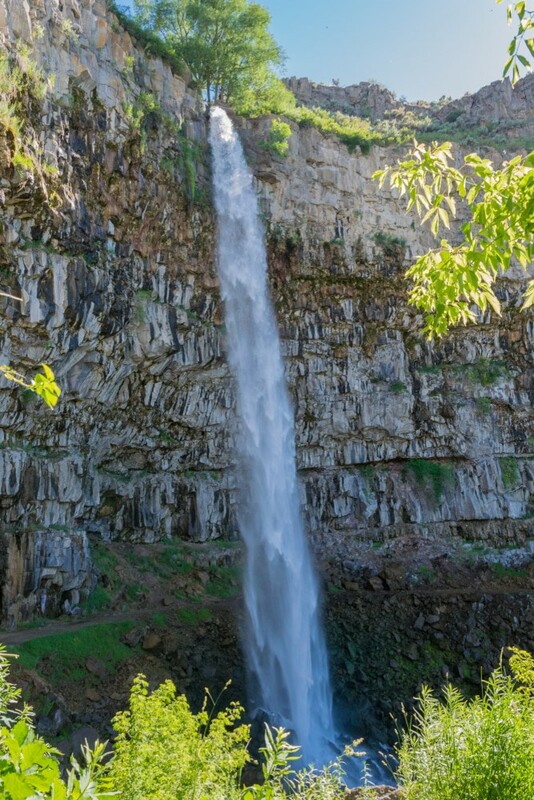 Torrelle Falls are beautiful and tall; they feature a narrow stream of water that flows down into a large pool. The falls are simple and tranquil and offer a relaxing experience. You can access Torrelle Falls just off Scenic Route 57. After you follow the road for approximately 10 minutes, you will reach the falls. If you continue along this road, you will come across another waterfall – Mission Falls. Either falls offer incredible views from above. You don’t want to miss Torrelle Falls when visiting Idaho.